To find out more about the performance, we spoke with Reel Orchestrette’s Bradford Reed and Geoff Gersh. 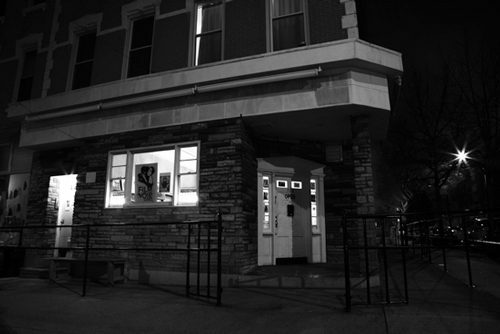 GP: Tell me a little bit about what’s in store at Film Noir on July 22. 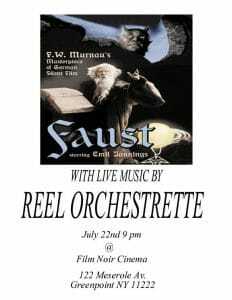 Geoff: We’ll be live scoring Faust, which is a film we’ve performed to a few times before. Our approach includes some pre-written ideas mixed in with some improvisation. We like to leave a lot up the moment so we can react to what’s happening on screen. Since we’ve done this film before we’re familiar with it and know the overall vibe of the film, and I think people can expect a pretty diverse musical experience, from very ambient sections to more upbeat sections. Bradford: The sounds we use are unconventional to a certain extent. We’re both pretty heavily rock influenced, and like to work in groove-based modalities. I play a homemade instrument called the pencilina, which is a 10-string electro-acoustic instrument that I invented. I also use a modular synthesizer, which is really special. And Geoff uses a guitar, but he also does a lot of unconventional things with it. He bows it with files and uses some interesting electronic processing techniques. So it’s really out of the realm of your typical silent film-type music. GP: I was talking with Will at Film Noir the other day about how, back in their heydays, silent films were always screened with live music. I’m curious to know if you’ve done any research into what music would have accompanied Faust in theaters back in the 1920’s. Geoff: No, not at all. There’s a long history of people doing music to silent films, and there’s a very specific vocabulary, or style that people associate with silent films. And while we respect the films and the genre, we very much go against the grain. So doing research into the original score is not of interest to us. GP: When I think of silent film music I always think of the Wurlitzer – is that the sort music you want to stay away from? Bradford: Yeah, that’s part of it. Or the piano with the diminished chords when it’s scary, and the major romantic chords when the lovers are on the screen. To a certain extent a lot of that has made its way into Hollywood scoring sensibilities. But for us, the film really becomes our conductor. It almost works like a score, or a vehicle that carries us. And since we’ve done this so many times, we can sort of anticipate ways to respond to the film. In today’s age, people have a lot of expectations about entertainment, and I think bringing a more contemporary approach to the music gives the films a new kind of propulsion. GP: Can you tell me a little bit more about how you describe your sound? Bradford: We’re into a lot of different kinds of music as listeners and as players. I like a lot of Eastern music – I love gamelan and phasing, syncopated rhythmic stuff. And Geoff loves metal. So sometimes we have collisions of those sensibilities, which can be really nice. Geoff: It’s kind of hard to answer that question – we can’t just say we play in a rock band that does film scores. There’s a lot going on. 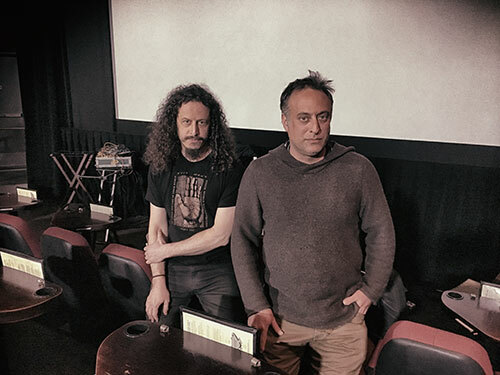 If you look at our website you’ll see a reel with samples of films that we’ve done, and the music spans everything from rock, Eastern music and blues to very ambient, spatial stuff. Even 20th century chamber music finds its way in. GP: So you said your performances are a mix of written ideas and improvisation – can you tell me more about how you improvise together? Geoff: We’ve been doing this for about 5 years now, and there’s always a degree of improvisation. For the very first film we did, we spent a lot of time scoring, writing music for just about every scene. Over the years we’ve moved towards writing down a few different ideas and calling them out as we’re playing. Bradford: We have a system of conducting each other. Geoff: It’s not traditional written music. It’s almost like written instructions. Sometimes it’ll be a chord progression, or a melodic idea, and we’ll conduct each other in the moment using hand signals. But we’ve also gone as far as going into a film and completely improvising. These days it varies – we don’t have a set way of approaching things. It depends on the film. Bradford: Familiarizing ourselves with the structure of the film and the timing of the film is part of our preparation. And the music ideas are sort of modular, things that can lock together in different places, like blocks. We like to stay engaged with the film and with each other, so we’ll change it up and do things in a way that keeps us involved. We love doing it—it’s really fun—and we like to do it in a way that keeps us engaged and serves the film. GP: How did you two connect with Will at Film Noir Cinema? Bradford: A neighbor of his suggested we contact him. We love playing there and we really hope to become a local fixture. We’d been trying to find a venue where we could do this regularly, because we like doing it so much, but other venues are difficult because of their size and financial constraints. But Film Noir and Will’s enthusiasm and sensibility are a perfect match for us. So we’re really excited about this new relationship. Tickets for the live-scored Faust (Saturday July 22, 9pm)—and all other screenings— are not available online, but you can purchase them in person anytime.